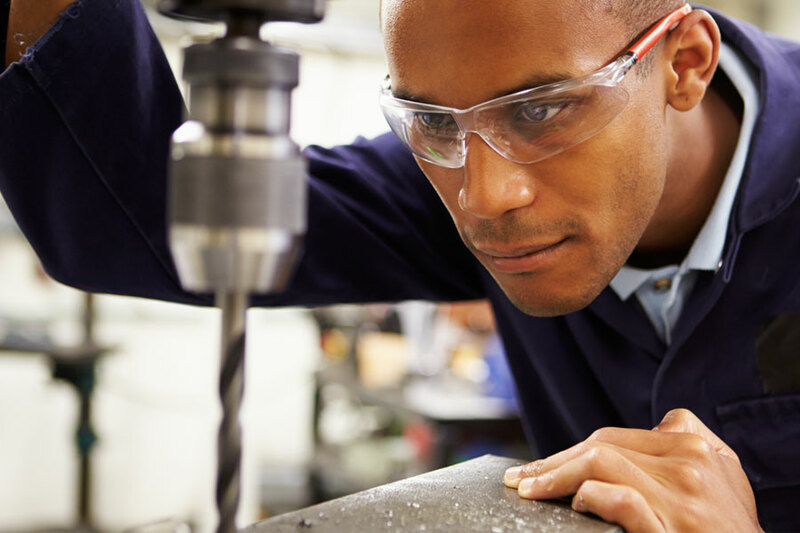 Safety glasses can prevent up to 90% of work related eye injuries, and that means that they are a necessity when laboring in environments where there are airborne pollutants and dust that can damage the eyes. When looking for the right glasses for you, definitely steer towards a model that is OSHA approved and comfortable to wear. OSHA standards were established by the American National Standards Institute, and any design that meets these requirements is guaranteed to get the job done right. You need a polycarbonate frame that is resistant to damage, and also prevents the unnecessary buildup of fog. You can find protective glasses as well as goggles, and the version that is right for you depends upon what kind of work you’ll be doing. Clear lenses are often best, but some models come with UV protection which is an added bonus. Fog control is achieved by wearing a design that is well ventilated. Most glasses are adjustable and will fit the majority of head sizes, but be sure to try something on before you buy. 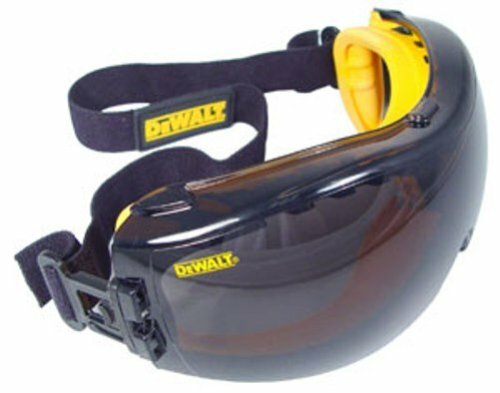 This dual mold Concealer goggle from Dewalt is perfect for providing protection from airborne eye irritants, and is designed for the ultimate in fog control and ventilation. The impact resistant lenses will never break, and the dual-injection rubber is a perfect soft and comfortable seal around your delicate eyes. The cloth head strap is fully adjustable, making these goggles suitable for all head sizes. The ventilation channel is the genius behind preventing the build-up of fog. With the clip attachment you can easily replace the lenses, should you ever need to. However, it might not be a problem because the lenses are so durable that they’re going to last you for a very long time. 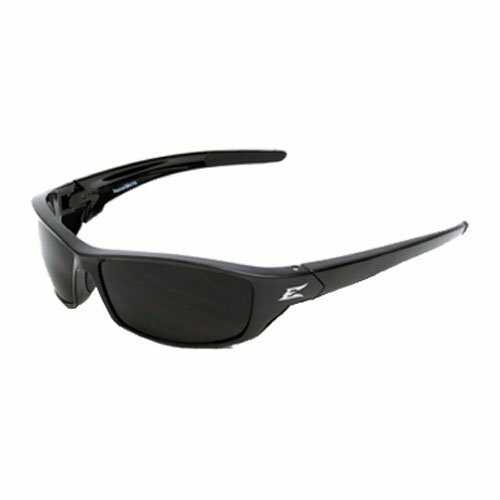 Made of tough polycarbonate, the lenses can withstand even the toughest of blows. These goggles are great for multipurpose use, and offer all the protection and comfort that you need for a long day on the job or working on projects around the house. The incredibly flexible nylon frame and polycarbonate scratch resistant lenses of these safety glasses from Edge Eyewear make them durable and comfortable. The added feature of soft Megol tempe tips makes them more pleasurable to wear than a lot of other models on the market. The construction meets a number of regulations, and the black design with smoke lens just looks awesome. 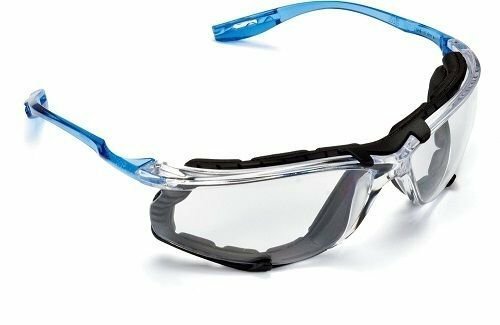 If you’re looking for safety glasses that are built tough, and are still lightweight and cozy, then the design of these glasses are going to please you. They’re also economical, providing all the performance you need without the extra expense. Whether working professionally, or doing projects at home, these glasses can help to protect your delicate eyes from airborne irritants at all times. They are completely ANSI Z87.1 +2010 compliant and Ballistic MIL_PRF 31013 3.5.1.1 compliant, and the innovative design is patented and tested for the highest level of performance. These clear, anti-fog lenses from 3M are not only lightweight and comfortable, but they’re also versatile to suit your needs. The Cord Control System comes with an optional foam gasket attachment, and this design helps you to keep your corded earplugs attached at all times. This also prevents tangling and makes it more convenient. What the foam gasket does is limits your eye’s exposure to harmful dust, while also providing cushioning for extra comfort and a snug fit. The polycarbonate lenses prevent the build-up of fog within the glasses, and they also absorb 99.9 % of UV rays. This design meets the requirements of CSA Z94.3-07, and has an impact rated to ANSI Z87.1-2010. Like all 3M products, this eyewear is highly protective, comfortable, and is really built to last for years. The added features make them stand out from the rest, and you’re guaranteed to actually enjoy wearing these glasses throughout the day. They also happen to be good looking. There’s no reason why you should have to look like a goof when wearing your protective eyewear.